Electro Harmonix Big Muff Pi Review – Best Fuzz Distortion Pedal? Is it a fuzz? Is it a distortion? No, it’s a Muff! The Electro Harmonix Big Muff Pi has been around for decades providing guitarists with a fuzz-like distortion that you won’t find anywhere else. With all the competing variations of fuzz and distortion effects pedals available, it’s time we put this EHX classic to the test and see if it’s still as good as your dad remembers. In our Electro Harmonix Big Muff Pi review, you’ll find out it still holds up 40 years after its debut. Volume, Tone, & Sustain Controls: The controls are pretty simple, allowing you to set your output, color your sound, and crank up the saturation with ease. True-Bypass Footswitch: This lets you pull this beast out of your signal chain when disengaged for pure, uncolored guitar tone. 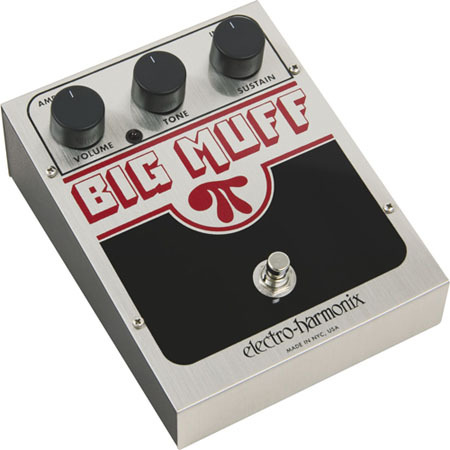 Read more about the Electro Harmonix Big Muff Pi at EHX.com. I started out just running a humbucker equipped Gibson SG into the nice full clean channel with no sign of distortion. I set the knobs around noon and kicked it on. I was instantly hit by a massive wave of distortion. This pedal has thick fuzzy gain for days. 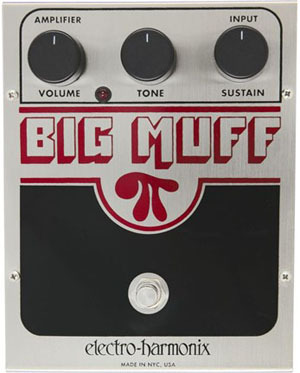 The Big Muff is great for making a big noise, especially good for grungy rhythms and indy-rock stylings. Sustain is greatly increased for chords and single notes alike. And there is an even compression of your sound which I rather like. The Tone control works well for darkening the effect or brightening things up. This is great for finding your perfect lead sound. With a mild twist, you’ll find just the right setting to cut through the mix. The Sustain control borderlines on insane, if not crossing the line entirely. Pushing the knob near 3 o’clock yields thick saturation and sustain for days, perfect for composing epic solos and holding out long notes. Pushing the Volume and Sustain controls hard unleashes an unruly monster monster, although that may be just what you’re looking for. With careful adjustments you can sculpt tasteful tones with ease or conjure up face-melting distortion. The Big Muff Pi has inspired countless clones and variations. EHX also produces several other guitar pedals that carry the “Muff” name including their Metal Muff with Top Boost and the Big Muff Pi with Tone Wicker, the former being an entirely new extreme distortion pedal and the latter ing a variation of the Big Muff Pi with a couple extra features and in a smaller enclosure. EHX’s new Deluxe Big Muff Pi might just be the ultimate “muff” pedal ever produced. The Electro Harmonix Big Muff Pi is a classic pedal that’s still going strong. Whether you want tasteful lead tones or all-out sonic mayhem, the Big Muff Pi handles it all with ease. A surprisingly musical box, this pedal might be just what you need to craft your perfect sound. If you’re looking for a fuzz, distortion, or a bit of both, the Big Muff Pi is certainly a contender for the best fuzz distortion out there. We recommend having a slice of this pi. That concludes our Electro Harmonix Big Muff Pi review. Thanks for reading. 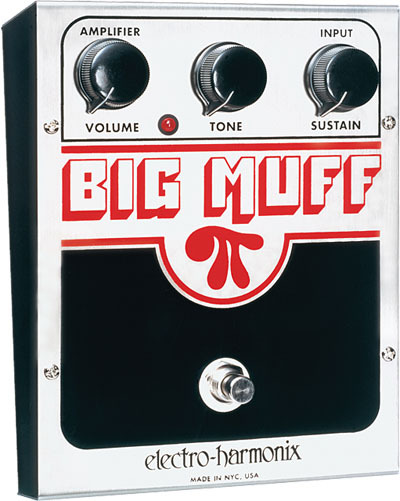 Want to buy the Electro Harmonix Big Muff Pi? Beginner guitarist check out our guide to online guitar lessons. I have had 2 of these over time. My first one ran only on a battery…lol. Unfortunately out of production for decades. or prettied up…snarls and growls and gasps all left alone. Dead cool!